Check out the plastic bin at the front! We’ve got a book on Plastic Collectables, so I’d asked Aidan to keep his eyes open for anything. This made me smile quite a lot. I think I’ll put it on my desk at work. 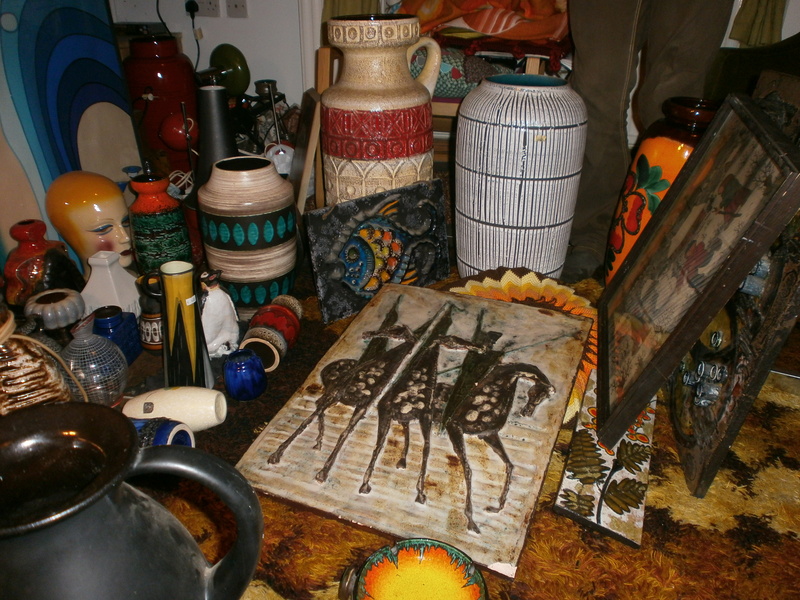 Some fantastic pottery – gorgeous, gigantic Fohr pot and that amazing Schäffenacker wall plaque (with the horses on). 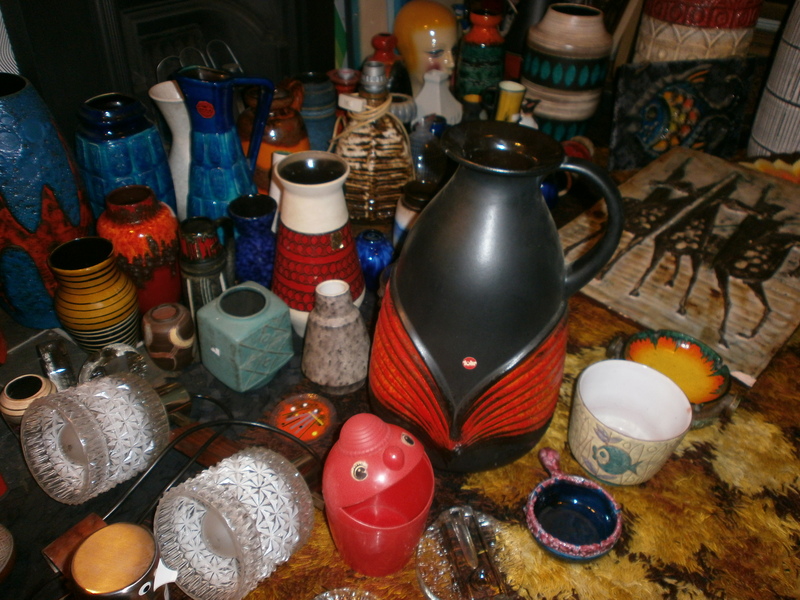 It’s not just West German Pottery that he brought back this time; many ’60s lights, retro curtains, couple of pictures and quite a few 1950s atomic pieces are now mixed in amongst the pots. The most difficult part is deciding what to keep and what to sell! Much of what’s on the picture above, we’re keeping. There are a few strays lurking in there, but there are plenty we like enough to keep… at least for a while, anyway! Some good stuff here that we’re definitely keeping. 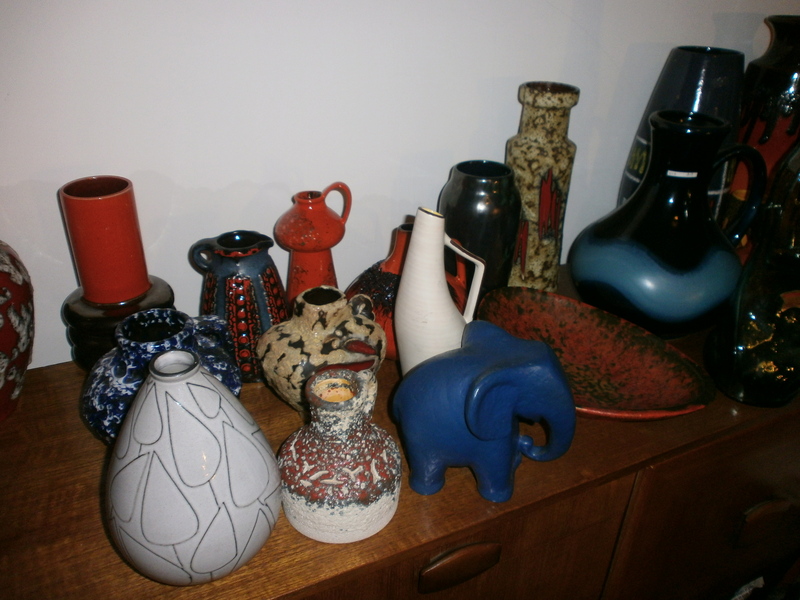 The Karlsruhe Majolica elephant is staying, as is the ES Keramik hiding slightly behind it. I absolutely hate the Silberdistel ‘blood and icing’ vase (as Jen from Wowie Zowie christened the glaze once), but Aidan loves it so it’s staying. The Ruscha ‘Vulcano’ dish will probably get sold after we both confessed that we’re not that keen on it. 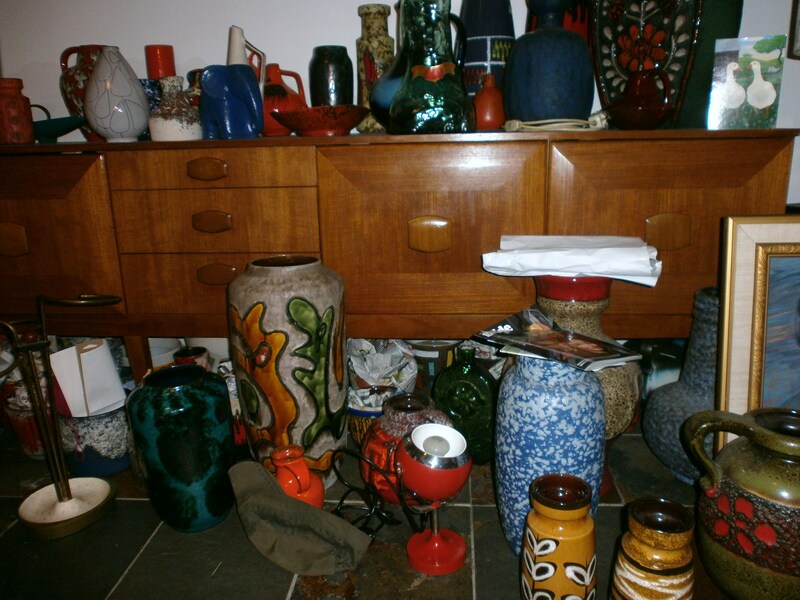 And a few other random bits and bobs of interesting shapes and glazes; quite an eclectic mix of ‘keepers’ really. Last but definitely not least (and actually, not even last as there’s loads more I’ve not photographed yet); is this giant Ruscha wall plate. 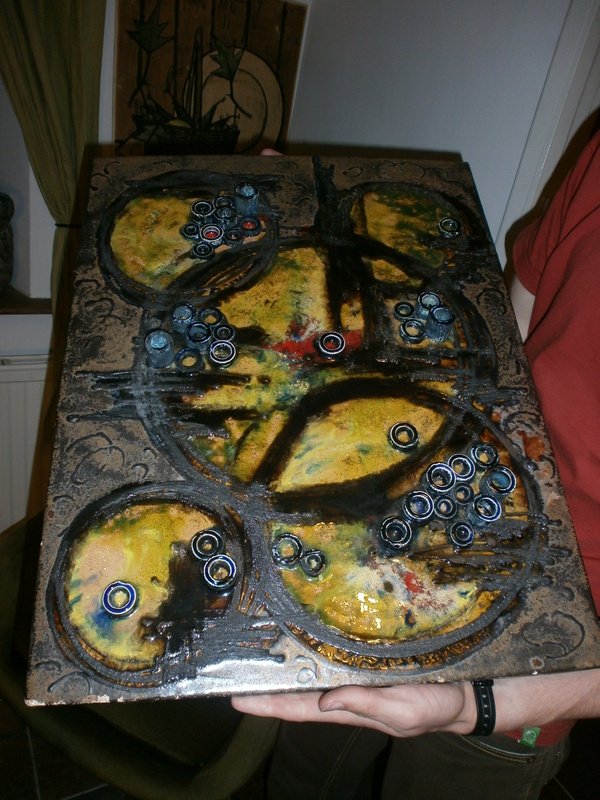 The circles are 3D, standing up from the base which is intricately glazed with a whole smattering of colours. It looks like some kind of frenzied Pacman game gone haywire. This one is most definitely staying put with us, and most likely going onto the wall sometime soon. There you have it – a not-so-quick preview of some of the newest items. What do you like the look of so far? Ooooh I am jealous. Especially that huge floor vase and the Schaeffenacker are amazing.